Overview: This activity is based on the book The Very Hungry Caterpillar by Eric Carle. It is an opportunity to read a great book and create a fun craft! After reading The Very Hungry Catepillar, you can create your own hungry caterpillar with a mouth that opens and closes as it eats everything! Gather all your materials from the material list below, and then follow the instructions. Cut one inch off the pipe cleaner. Set aside. Place the cup on the green construction paper as shown and trace five circles. Trace one circle on the red construction paper. You should have six circles total. Carefully cut out the circles. Cut the red circle in half. First we will make the caterpillars’ body. Lay out the green circles in a caterpillar shape, like you see below. Glue the edges of the circles together. You can ask an adult for help with this step! Take the inch you cut from the pipe cleaner. Slowly and carefully, poke a hole with the pipe clear through both halves of the circle. Once you put the pipe cleaner through, test to see if the caterpillar can open and close his mouth! Then loosely twist the pipe cleaner so it stays on, but make sure you can still move the mouth. Glue the googly eyes on the top half of the red circle. Take the caterpillar’s body and place the red head next to the last green circle (see below). Make sure to only glue the top half of the head to the body, or else the mouth won’t move! Once you glue it, you have your own Very Hungry Caterpillar! 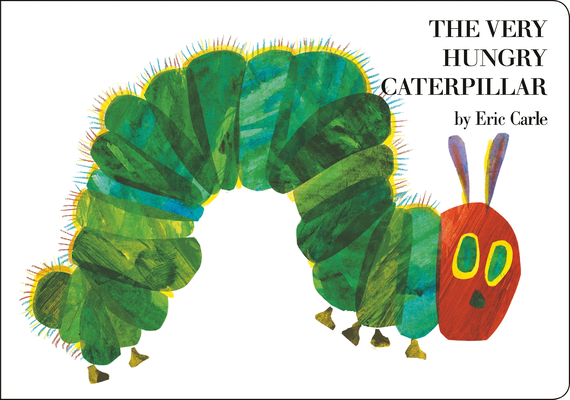 This book follows a hungry caterpillar on its journey to becoming a beautiful butterfly! The text and illustrations are sure to be engaging as well as educational. A great choice for second graders!